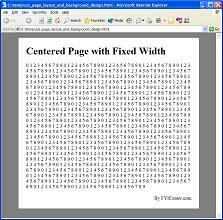 How To Center Your Page in Browser Windows? What Needs To Be Considered When Designing Page Layout? How To Test Browser Resolutions? How Wide Do You Want Your Page Content to Be? What Are the Page Widths on Popular Websites? What Are the Length Units Used in CSS? How To Set Page Width Relative To the Browser Width? How To Set Page Width to a Fixed Value? What Happen to Images with Absolute Page Width Units? How To Set Page Widths to Relative Length Units? What Happen to Font Sizes with Relative Page Width Units? How To Set Font Sizes to Relative Length Units? What Are the Background Style Properties? How To Specify a Background Image? How To Position Background Images? How To Specify Two Background Images on a Page?